We are always interested in partnering with other great companies where our combined energies and expertise can provide additional synergies. Please review the following information and note the respective contact information. Please provide as much detail as you can. Please note that calling, or emailing at a different email address may result in significant delays in response. In some cases, we provide wholesale and white label services to companies that qualify. 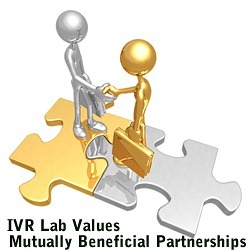 If you wish to resell our systems and or services to your own customers under your own label, please get in touch with us at wholesale@ivr-lab.com. Please be sure to provide as much information as possible. Please note that calling, or emailing at a different email address may result in significant delays in response. We are always on the lookout for quality suppliers to augment our existing network. If you feel you can offer us services that our customers can benefit from, please write to us in detail at @supplier@ivr-lab.com. Please note that calling, or emailing at a different email address may result in significant delays in response.